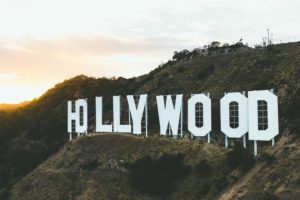 LA is known for is known for its city landscape and celebrity scenery. But when you look past all the skyscrapers, boulevards, and glamour, LA offers plenty of outdoor activities. Sometimes its easy to forget what more LA has to offer outside of the must see in-city attractions. The LA weather comes in handy for those who want to spend their time outdoors. At CeleBreak, we are always looking to have a great time before or after we play some soccer. As a result, we created this list of the best outdoor activities in LA . When you think of LA, Hollywood comes to mind. Hollywood Hills is located roughy 20 minutes away from our West Hollywood CeleBreak field. You are able to enjoy a hike and see one of the most prominent attractions in LA. You can start at the Griffith Observatory where you will see the sign from a distance as well as a magnificent view of the city. The hike is open during the same hours as the observatory, sunrise to sunset. There are three routes you can take, Mt Hollywood Trail (easy), the Brush Canyon Trail (moderate), and the Cahuenga Peak Trail (difficult). The Mt. Hollywood Trail is the most popular route which brings you to the second highest peak in the park. Brush Canyon will take you through the Bronson Caves. Lastly, for the more experienced hikers, theres Cahuenga Peak which starts on Aileen Getty Ridge Trial and includes the Hugh Hefner Overlook. 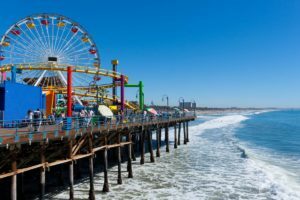 Enjoy a casual walk alongside Santa Monica Beach as you make your way to the pier. On the pier is Pacific Park, a full service amusement park as well as the solar powered red and yellow ferris wheel which is a city icon. You can walk around the amusement park for free but if you want to play the games or go on the rides you would have to buy tickets. You are able to buy different kinds of tickets depending on what specific things you wanted to do. There is also an aquarium under the pier at beach level which is another popular activity. Later on, you can sit in sand and enjoy the amazing sunsets that set right on the beach. When you make a trip to LA you cannot leave without taking a stroll through LA’s number one visitor attraction. The boardwalk stretches for a mile and half offering various things to do and to see. On the west side of the walk are hundreds of street performers and vendors. The east side has all the storefronts offering things from tattoo and piercings to surf and skate shops. 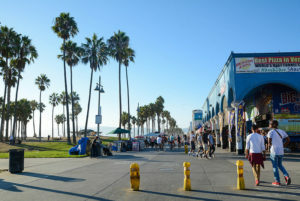 While you are here, you have to check out Muscle Beach located steps away from the sand of Venice Beach. Muscle Beach is one of the treasures of Venice and is where Arnold Schwarzenegger used to workout. Visit, watch a show, or workout yourself by getting a day pass for $10, $50 for a week, or $170 for a year membership. Along the walk, you will come across the Venice Skate Park which is one of the only parks in the world that is on a beach. Skate yourself or stop by and watch the skaters do their thing! Take some surfing lessons on LA’s most iconic beaches. You can sign up whether you are a beginner or experienced surfer who wants to take their skills to the next level. You can take lessons at Manhattan, Santa Monica or Venice Beach. The west coast, especially California is known for surfing so being able to be apart of the surfing culture for a day would be an incredible experience. Explore the city in a new way by renting bikes for the day! 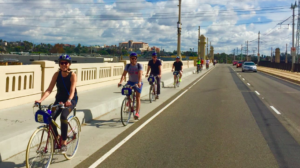 There are many different bike rental companies, but Bikes and Hikes LA offers various kinds of bikes depending on what you want to do. They have four different bikes you can choose from, a city, electric, road, or a mountain bike. What’s cool is that you can can ride at your own pace and for as long as you want since it’s self guided. For this company you can rent them per hour, per day, per week, or per month. The guided tours are also nice because you will learn about certain attractions but they are more expensive so it depends on what you are looking to do. Check out Perry’s Beach Cafe & Rentals where you can rent rollerblades or a mountain bike starting at $10 an hour or $35 for the whole day. They have tons of of other things available to rent ranging from surfboards to a chair and umbrella. If you have never ridden a Segway, then you have to try it. Riding one of these around the city is incredible and you are able to see many different things and having lots of fun doing so. Rent them on your own or get a group together for a private tour. Each Segway company has mandatory riding lessons before you start to make sure you are comfortable and ready to ride. There are many different Segway companies throughout LA. 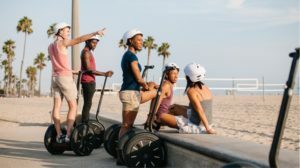 Segway LA for example states you can rent one at 12 years old, some other companies state that you have to be 21 years old. Intercontinental Los Angeles Century City – A hotel that offers yoga and Zumba classes on their rooftop helipad. Classes are free for hotel guests and $15 for non-guests. Do you love being active and being outdoors? Come join us at one of our soccer fields! At CeleBreak you have the ability to choose to play pickup soccer games at times that work best for you. Unlike typical soccer teams and clubs, CeleBreak organizes various games throughout the day you can join based on your personal schedule. Our games are available to everyone and after each match enjoy time with your team and meet new friends. It’s easy, download the app, pick your location, pick a time that works for you and join a team!